Joining the RAF at the beginning of the war, he found himself as a young fighter pilot with the crack 92 Squadron at RAF Biggin Hill, in 1941. That spring and summer he survived the air battles over Northern France with the Biggin Hill Wing, often flying as wingman to the famous and legendary "Sailor" Malan - Fighter Command's top-scoring pilot at that time. He quickly established himself as one of the most successful pilots in North Africa, winning the DFC and bar. He bought his score to twenty-one by the end of the Tunisian Campaign, was awarded the DSO, then given command of 145 Spitfire Squadron in Italy. Leading this unit in the summer of 1944 he brought his score to twenty-eight, receiving a second bar to his DFC. Towards the end of the war he became an RAF test pilot and later a member of the RAF's High Speed Flight. This was the start of a successful career as a test pilot after leaving the Service in 1948, having been awarded the AFC. Working for Hawkers, he became Chief Test Pilot and did all the major flight development on one of the most famous of all RAF peacetime aircraft - the Hawker Hunter, and with it took the world speed record in 1953. Test Pilot was first published in 1953. 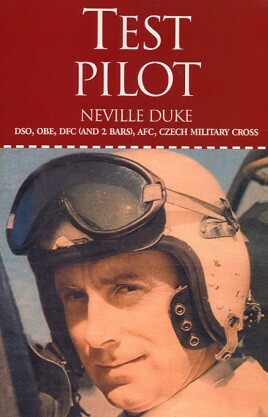 This new edition has an additional chapter covering Neville Duke's flying life from that date, and also has appendices and index, not included in the earlier book, together with a completely new selection of photographs.